As a kid, I really didn’t like that question because I never really had a good answer. I was more interested in the football game happening on TV, or the cookies sitting in the dining room for dessert. Don’t get me wrong, I still LOVE football and cookies, but now as an adult I really do enjoy thinking about what exactly I am grateful for in life. We all should be grateful for a lot of things throughout the entire year, but Thanksgiving is always a nice yearly reminder to put things in perspective and be mindful of what is good in your life. For the sake of this post, I debated keeping it to strictly professional things I am grateful for, but I came to find that working in a family business makes it rather difficult to keep the two COMPLETELY separate. This is a no-brainer. Not only did they quite literally give me life, they’ve also helped me every step of the way in becoming who I am today. To state the obvious, I wouldn’t be writing this post on the Mullooly Asset Blog if my father, Tom Mullooly, hadn’t started the firm back in 2002. It sounds cliché to say they taught me everything I know, but they SERIOUSLY taught me everything I know. Me and my two brothers are forever grateful for everything our parents have done for us. Thank you, Mom and Dad. If you know the Mullooly family at all, you know that the Mullooly brothers are about as close as it gets. With just four years separating the three of us, we grew up together and did just about everything together. We played sports together, went to high school together, all went to York College of PA together, joined the same fraternity together (double brothers! ), and now all work side by side together every single day. As some of you may know, in March of 2018, my younger brother Casey was diagnosed with Chronic Myeloid Leukemia (CML). This completely changed our lives forever. Casey has outlined his mental and physical battle with CML here, here, and here. Please take a few minutes to read these amazing posts. For me personally, it took a long time to process what happened and how I felt about everything. Holidays and birthdays now have a new meaning for me. It’s another opportunity to be grateful that, despite some tough and scary times, I still have the ones I love the most around me. Working for Mullooly Asset Management was all I ever really wanted to do (besides become a rock-star of course!) The thought of working alongside my family was all the convincing I needed to join the business. Then I actually started to dig into the work. Getting to learn the ropes of the business and eventually beginning to help clients is truly a blessing each and every day. While it’s not always sunshine and roses, seeing hard work pay off and truly being able to help people through some of the most important problems in their lives is what it’s all about. Mullooly Asset Management has given, and will continue to give, me the opportunity to make not only MY life better, but also our CLIENT’S lives better. For that, I am eternally grateful. After the last month and a half, I seriously debated if I actually am grateful for the stock market (KIDDING!). It sounds silly to say, but without the consistent ups and downs of the stock market, I wouldn’t have the career that I do. It’s provided me the ability to consistently learn new ideas, new strategies, and apply them to help other people. So as odd as it may sound, I am grateful there is a stock market. I’m looking at you, FinTwit! Seriously, what a great community of people trying to help one another get better at their craft. I’ve never seen anything like it. The amount of connections I’ve made on Twitter, and through my podcast Living With Money, is unbelievable. The amount of amazing, insightful, beneficial content that gets shared every day is absolutely fantastic. Social media gets a bad reputation sometimes, but the Finance Twitter community is truly a wonderful place! I’d be remiss not to mention our clients at Mullooly Asset Management. They are quite literally why we do what we do. The trust and appreciation we get from our clients is simply wonderful, and makes it all worthwhile. Thank you! There’s a lot of hate and negativity that gets spread around the world these days. It’s important to remember what you are truly grateful for, and all of the GOOD that happens on a daily basis. Be sure to take time as 2018 winds to a close to reflect on the GOOD things that happened this year. If there are people in your life that you love, and that matter to you, TELL THEM. 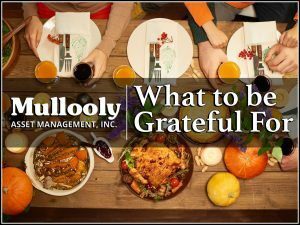 With Thanksgiving coming next week, I hope everybody reading this starts thinking of what they’re grateful for this holiday season. I’d love to hear what you’re thinking about it – feel free to let me know on Twitter @TimMulloolyMAM. Happy Thanksgiving!